Understand how to use credit responsibly before you get your first credit card. Credit card language can be scary, especially for students getting their first credit cards. Principal? Fixed Rate of Interest? Default rate? What? Yet these mysterious terms can be mastered and the average young person can become a king or queen of credit! Or at the very least, new-to-credit consumers and college students can be responsible users of credit. At first, I didn’t see the difference between a debit card and credit card. I mean, it seemed that the same machine swipes either debit or credit in stores. But beneath the pseudo-similar pieces of plastic are two completely different transaction processes. Swiping a debit card is like transferring money from your bank account to a store, while swiping a credit card is like signing an IOU. With a credit card, you are essentially telling the store, I want to spend $862 for the purchase. You swipe your credit card, and the credit card issuer gives the store $862 for the sale. At the end of month, the bank says, “I want my money back,” and sends you a bill. Now, if you pay off the $862 in that first month, the credit card issuer doesn’t charge any interest. If you only pay the minimum amount required, say $26, then the bank charges interest on the remaining $836 balance you still owe. Charging that extra interest is a huge way banks make money off cardholders. The variable interest rate you are charged is determined by your credit cards issuer or bank, and depends largely on how creditworthy you are based on your credit score. Being creditworthy means that lenders and banks assess that you can responsibly manage, and pay back, borrowed credit. The better your credit score, the more responsible you appear to banks, and the lower your variable rate of interest. That means, check your credit score regularly, improve your credit by using your credit card responsibly, and you’ll receive better interest rates and financial offers the next time you apply for a credit card or loan. A credit card may seem simple, but it can be dangerous. The “buy now-pay later” mentality that often comes with credit card ownership is a rampant disease, and you definitely want to be vaccinated. According to recent data, the average consumer carries $7,404 in credit card debt. Before swiping your own plastic, ask yourself if you have the discipline and common sense to spend wisely and within your means. The best time to get a credit card is when you don’t need one. This way, you don’t rely on your credit card and end up overcharging on credit you can’t afford to pay back. Having a credit card is most beneficial when you can pay off your balance in full every month and build your credit painlessly. Ask the right questions. Sometimes you can even negotiate with the bank to lower your interest rate. Establish a good credit score. A higher credit score can help you negotiate for a better interest rate for your first credit card, and set you up to be approved for better credit cards with better perks in the future. You can also raise your credit score by keeping up good payments on your student loans every month. Also, shop around for other types of credit cards like student credit cards and secured credit cards to get the right kind of card to help you establish your credit. If this is your first card, you’ll likely get an introductory interest rate. Ask when the introductory period ends and what the rate is afterwards. Remember, you’ll have this card for a long time so prepare for the long-term. Check for annual fees. Even if a card starts without a fee, companies may tack one on later. Continuously stay on top of your monthly credit card statement to see if any terms or fees change. Check the default rate. This is the rate of interest that is charged if you do not pay the minimum payment at the due date and time. These interest rates are typically 28-35%, so pay at least the minimum balance or you’ll be paying through the nose in the default interest charge afterward. Some credit cards expect payments twice, rather than once, a month. Check the billing cycle before you open the card. Have a game plan to build credit. A friend of mine is building her credit by using her card to only purchase items she has already budgeted for, such as groceries and school supplies. This way, she can pay the bill at the end of the month and establish a good credit history and she is only 21! And finally, read the fine print! It might be boring, but credit card issuers have started to simplify and boil down credit card statements to be more transparent and understandable. Buckle down and get through the dense material, and Google words you aren’t sure about so you thoroughly understand what you are getting into. These are just a few tips and insights, that I’ve gathered as I figure out my own credit card situation, that are hopefully useful for your first credit card. 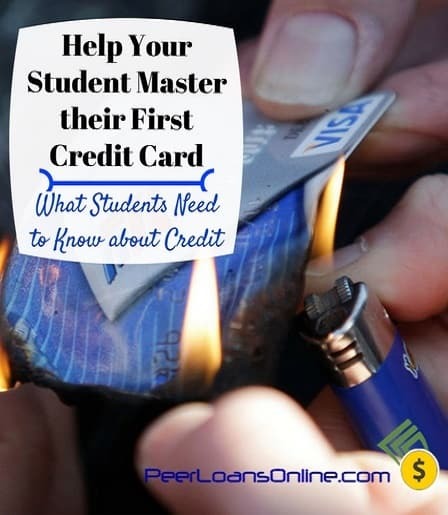 The tips can be used by anyone and work great for students getting their first credit account. Now you’re more prepared to build your credit, spend responsibly, and wield this powerful tool of plastic.